This article is about people of the U.S. with roots in England. For the language, see American English. For other uses, see American English (disambiguation). English Americans (also referred to as Anglo-Americans) are Americans whose ancestry originates wholly or partly in England. In the 2017 American Community Survey, English Americans are (7.1%) of the total population. The term is distinct from British Americans, which includes not only English Americans but also Scottish Americans, Scotch-Irish Americans (Northern Ireland), Welsh Americans, Cornish Americans and Manx Americans from the whole of the United Kingdom. However, demographers regard this as a serious undercount, as the index of inconsistency is high and many if not most Americans from English stock have a tendency to identify simply as "Americans" or if of mixed European ancestry, identify with a more recent and differentiated ethnic group. In the 1980 Census, over 49 million (49,598,035) Americans claimed English ancestry, at the time around 26.34% of the total population and largest reported group which, even today, would make them the largest ethnic group in the United States. Scotch-Irish Americans are for the most part descendants of Lowland Scots and Northern English (specifically - County Durham, Cumberland, Northumberland and Yorkshire) settlers who colonized Ireland during the Plantation of Ulster in the 17th century. In 1982, an opinion poll showed respondents a card listing a number of ethnic groups and asked, "Thinking both of what they have contributed to this country and have gotten from this country, for each one tell me whether you think, on balance, they've been a good or a bad thing for this country." The English were the top ethnic group, with 66% saying they were a good thing for the United States, followed by the Irish at 62%. Ben J. Wattenberg argues that this poll demonstrates a general American bias against Hispanics and other recent immigrant populations. The majority—57%--of the Founding Fathers of the United States were of English extraction. English immigrants in the 19th century, as with other groups, sought economic prosperity. They began migrating in large numbers, without state support, in the 1840s and continued into the 1890s. England United States. Shows the first permanent English settlement of Jamestown in 1607. Since 1776, English-Americans have been less likely to proclaim their heritage, unlike African Americans, Irish Americans, Scottish Americans, Italian Americans or other ethnic groups. A leading specialist, Charlotte Erickson, found them to be ethnically "invisible," dismissing the occasional St. George Societies as ephemeral elite clubs that were not in touch with the larger ethnic community. In Canada, by contrast, the English organized far more ethnic activism, as the English competed sharply with the well-organized French and Irish elements. In the United States the Scottish immigrants were much better organized than the English in the 19th century, as are their descendants in the late 20th century. The original 17th century settlers were overwhelmingly English. From the time of the first permanent English presence in the New World until 1900, these immigrants and their descendants outnumbered all others firmly establishing the English cultural pattern as predominant for the American version. In 1790 the U.S. conducted its first national population census. The ancestries of the population in 1790 has been estimated by various sources, first in 1932 then again in 1980 and 1984 by sampling distinctive surnames in the census and assigning them a country of origin. There is debate over the accuracy between the studies with individual scholars and the Federal Government using different techniques and conclusion for the ethnic composition. A study published in 1909 titled A Century of Population Growth by the Government Census Bureau estimated the English were 83.5% of the white population. The states with the highest percentage by the same Census Bureau data in 1909 (% of the total European population) of English ancestry were Connecticut 96.2%, Rhode Island 96.0%, Vermont 95.4%, Massachusetts 95.0%, New Hampshire 94.1%, Maine 93.1%, Virginia 85.0%, Maryland 84.0%, North Carolina 83.1%, South Carolina 82.4%, New York 78.2%, Pennsylvania 59.0%. Another source by Thomas L. Purvis in 1984 estimated that people of English ancestry made up about 47.5% of the total population or 60.9% of the white or European American population (his figures can also be found, and as divided by region, in Colin Bonwick, The American Revolution, 1991 p. 2540-839-1346-2). Some 80.7% of the total United States population was of European origin. Around 757,208 were of African descent with 697,624 being slaves. In 1980, 23,748,772 Americans claimed only English ancestry and another 25,849,263 claimed English along with another ethnic ancestry. It must be noted that 13.3 million or 5.9% of the total U.S. population chose to identify as "American" (counted under "not specified") as also seen in censuses that followed. Below shows the persons who reported at least one specific ancestry are as follows. At a national level the ancestry response rate was high with 90.4% of the total United States population choosing at least one specific ancestry and 9.6% ignored the question completely. Of those who chose English, 66.9% of people chose it as their first response. Totals for the English showed a considerable decrease from the previous census. Responses for "American" slightly decreased both numerically and as a percentage from 5.9% to 5.2% in 1990 with most being from the South. In 1900, an estimated 28,375,000 or 37.8% of the population of the United States was wholly or primarily of English ancestry from colonial stock. As with any ethnicity, Americans of English descent may choose to identify themselves as just American ethnicity if their ancestry has been in the United States for many generations or if, for the same reason, they are unaware of their lineages. In total, there are estimated to be around 678,000 British born expatriates in the United States with the majority of these born in England. There are around 540,000 of any race in the United States, 40,000 Asian British, 20,000 Black British people and approximately 10,000 people of a mixed background. Percentages by county in the 2000 census. Population by state in the 2000 census. Percentages by U.S. State in the 2000 census. English was the highest reported European ancestry in the states of Maine, Vermont and Utah; joint highest along with German in the Carolinas. 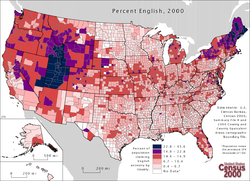 On the top right, a map showing percentages by county of Americans who declared English ancestry in the 2000 Census. Dark blue and purple colours indicate a higher percentage: highest in the east and west (see also Maps of American ancestries). Center, a map showing the population of English Americans by state. On the right, a map showing the percentages of English Americans by state. English settlement in America began with Jamestown in the Virginia Colony in 1607. With the permission of James I, three ships (the Susan Constant, The Discovery, and The God Speed) sailed from England and landed at Cape Henry in April, under the captainship of Christopher Newport, who had been hired by the London Company to lead expeditions to what is now America. The second successful colony was Plymouth Colony, founded in 1620 by people who later became known as the Pilgrims. Fleeing religious persecution in the East Midlands in England, they first went to Holland, but feared losing their English identity. Because of this, they chose to relocate to the New World, with their voyage being financed by English investors. In September 1620, 102 passengers set sail aboard the Mayflower, eventually settling at Plymouth Colony in November. 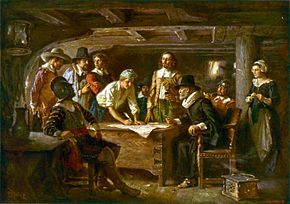 Of the passengers on the Mayflower, 41 men signed the "Mayflower Compact" aboard ship on November 11, 1620, while anchored in Provincetown Harbor. Signers included Carver, Alden, Standish, Howland, Bradford, Allerton, and Fuller. This story has become a central theme in the United States cultural identity. A number of English colonies were established under a system of proprietary governors, who were appointed under mercantile charters to English joint stock companies to found and run settlements. England also took over the Dutch colony of New Netherland (including the New Amsterdam settlement), renaming it the Province of New York in 1664. With New Netherland, the English came to control the former New Sweden (in what is now Delaware), which the Dutch had conquered from Sweden earlier. This became part of Pennsylvania. Cultural similarities and a common language allowed English immigrants to integrate rapidly and gave rise to a unique Anglo-American culture. An estimated 3.5 million English immigrated to the U.S. after 1776. English settlers provided a steady and substantial influx throughout the 19th century. The first wave of growing English immigration began in the late 1820s and was sustained by unrest in the United Kingdom until it peaked in 1842 and declined slightly for nearly a decade. Most of these were small farmers and tenant farmers from depressed areas in rural counties in southern and western England and urban laborers who fled from the depressions and from the social and industrial changes of the late 1820s-1840s. While some English immigrants were drawn by dreams of creating model utopian societies in America, most others were attracted by the lure of new lands, textile factories, railroads, and the expansion of mining. A number of English settlers moved to the United States from Australia in the 1850s (then a British political territory), when the California Gold Rush boomed; these included the so-called "Sydney Ducks" (see Australian Americans). During the last years of the 1860s, annual English immigration grew to over 60,000 and continued to rise to over 75,000 per year in 1872, before experiencing a decline. The final and most sustained wave of immigration began in 1879 and lasted until the depression of 1893. During this period English annual immigration averaged more than 82,000, with peaks in 1882 and 1888 and did not drop significantly until the financial panic of 1893. The building of America's transcontinental railroads, the settlement of the great plains, and industrialization attracted skilled and professional emigrants from England. Also, cheaper steamship fares enabled unskilled urban workers to come to America, and unskilled and semiskilled laborers, miners, and building trades workers made up the majority of these new English immigrants. While most settled in America, a number of skilled craftsmen remained itinerant, returning to England after a season or two of work. Groups of English immigrants came to America as missionaries for the Salvation Army and to work with the activities of the Evangelical and LDS Churches. The depression of 1893 sharply decreased English emigration to the United States, and it stayed low for much of the twentieth century. This decline reversed itself in the decade of World War II when over 100,000 English (18 percent of all European immigrants) came from England. In this group was a large contingent of war brides who came between 1945 and 1948. In these years four women emigrated from England for every man. In the 1950s, English immigration increased to over 150,000.and rose to 170,000 in the 1960s. While differences developed, it is not surprising that English immigrants had little difficulty in assimilating to American life. The American resentment against the policies of the British government was rarely transferred to English settlers who came to America in the first decades of the nineteenth century. As the earliest colonists of the United States, settlers from England and their descendants often held positions of power and made and enforced laws, often because many had been involved in government back in England. In the original 13 colonies, most laws contained elements found in the English common law system. The majority—57%-- of the Founding Fathers of the United States were of English extraction. Scottish extraction characterized 16%, 19% were Irish or Scots-Irish, and 5% were Welsh. A minority were of high social status and can be classified as White Anglo-Saxon Protestant (WASP). Many of the prewar WASP elite were Loyalists who left the new nation. While WASPs (White Anglo-Saxon Protestants usually of English origins) have been major players in every major American political party, an exceptionally strong association has existed between WASPs and the Republican Party, before the 1980s. A few top Democrats qualified, such as Franklin D. Roosevelt. Northeastern Republican leaders such as Leverett Saltonstall of Massachusetts, Prescott Bush of Connecticut and especially Nelson Rockefeller of New York exemplified the pro-business liberal Republicanism of their social stratum, espousing internationalist views on foreign policy, supporting social programs, and holding liberal views on issues like racial integration. A famous confrontation was the 1952 Senate election in Massachusetts where John F. Kennedy, a Catholic of Irish descent, defeated WASP Henry Cabot Lodge, Jr.. However the challenge by Barry Goldwater in 1964 to the Eastern Republican establishment helped undermine the WASP dominance. Goldwater himself had solid WASP credentials through his mother, of a prominent old Yankee family, but was instead mistakenly seen as part of the Jewish community (which he had never associated with). By the 1980s, the liberal Rockefeller Republican wing of the party was marginalized, overwhelmed by the dominance of the Southern and Western conservative Republicans. Asking "Is the WASP leader a dying breed?" journalist Nina Strochlic in 2012 pointed to eleven WASP top politicians—typically scions of upper class English families. She ending with Republicans G.H.W. Bush elected in 1988, his son George W. Bush elected in 2000 and 2004, and John McCain, who was nominated but defeated in 2008. English is the most commonly spoken language in the U.S, where it is estimated that two thirds of all native speakers of English live. The American English dialect developed from English colonization. It serves as the de facto official language, the language in which government business is carried out. According to the 1990 census, 94% of the U.S. population speak only English. Adding those who speak English "well" or "very well" brings this figure to 96%. Only 0.8% speak no English at all as compared with 3.6% in 1890. American English differs from British English in a number of ways, the most striking being in terms of pronunciation (for example, American English retains voicing of the letter "R" after vowels, unlike standard British English) and spelling (one example is the "u" in words such as color, favor (US) vs colour, favour (UK)). Less obvious differences are present in grammar and vocabulary. The differences are rarely a barrier to effective communication between American English and British English speakers, but there are certainly enough differences to cause occasional misunderstandings, usually surrounding slang or dialect differences. "In for a penny, in for a pound" is an expression to mean, ("if you're going to take a risk at all, you might as well make it a big risk"), is used in the United States which dates back to the colonial period, when cash in the colonies was denominated in Pounds, shillings and Pence. Today, the one-cent coin is commonly known as a penny. A modern alternative expression is "In for a dime, in for a dollar". Much of American culture shows influences from English culture. Apple pie - New England was the first region to experience large-scale English colonization in the early 17th century, beginning in 1620, and it was dominated by East Anglian Calvinists, better known as the Puritans. Baking was a particular favorite of the New Englanders and was the origin of dishes seen today as quintessentially "American", such as apple pie and the oven-roasted Thanksgiving turkey. "As American as apple pie" is a well-known phrase used to suggest that something is all-American. The First Thanksgiving at Plymouth Colony by English Pilgrims in October 1621. Thanksgiving - It has become a national secular holiday (official since 1863) with religious origins, but in England it remains a Church festival giving thanks to God for the harvest. The first Thanksgiving was celebrated by English settlers to give thanks to God for helping the Pilgrims of Plymouth Colony survive the brutal winter. This feast lasted three days, and—as accounted by attendee Edward Winslow—it was attended by 90 Native Americans and 53 Pilgrims. Englishman William Bradford is credited as the first to proclaim the American cultural event which is generally referred to as the "First Thanksgiving". English-born Henry Chadwick is often called the "father of Baseball". Baseball - The earliest recorded game of base-ball for which the original source survives, involved none other than the family of the Prince of Wales, played indoors in London in November 1748. The Prince is reported as playing "Bass-Ball" again in September 1749 in Walton-on-Thames, Surrey, against Lord Middlesex. The English lawyer William Bray wrote in his diary that he had played a game of baseball on Easter Monday 1755 in Guildford, also in Surrey. English lawyer William Bray recorded a game of baseball on Easter Monday 1755 in Guildford, Surrey; Bray's diary was verified as authentic in September 2008. This early form of the game was apparently brought to North America by British immigrants. The first appearance of the term that exists in print was in "A Little Pretty Pocket-Book" in 1744, where it is called Base-Ball. Today, Rounders which has been played in England since Tudor times holds a similarity to Baseball. Although, literary references to early forms of "base-ball" in the United Kingdom pre-date use of the term "rounders". American football - can be traced to early versions of rugby football, played in England and first developed in American universities in the mid-19th century. The American legal system also has its roots in English law. For example, elements of the Magna Carta were incorporated into the United States constitution. English law prior to the revolution is still part of the law of the United States, and provides the basis for many American legal traditions and policies. After the revolution, English law was again adopted by the now independent American States. American national anthem - takes its melody from the 18th-century English song "To Anacreon in Heaven" written by John Stafford Smith from England for the Anacreontic Society, a men's social club in London and lyrics written by Francis Scott Key of English descent. This became a well-known and recognized patriotic song throughout the United States, which was officially designated as the U.S. national anthem in 1931. Hail to the Chief - is the song to announce the arrival or presence of the President of the United States. English songwriter James Sanderson (c. 1769 – c. 1841), composed the music and was first performed in 1812 in New York. Before 1931, other songs served as the hymns of American officialdom. The Liberty Song - written by John Dickinson of English descent in 1768 to the music of Englishman William Boyce's "Heart of Oak", is perhaps the first patriotic song written in America. The song contains the line "by uniting we stand, by dividing we fall", the first recorded use of the sentiment. My Country, 'Tis of Thee - whose melody was indirectly derived from the British national anthem, also served as a de facto anthem before the adoption of "The Star-Spangled Banner." Amazing Grace - written by English poet and clergyman John Newton became such an icon in American culture that it has been used for a variety of secular purposes and marketing campaigns, placing it in danger of becoming a cliché. Yankee Doodle - is written and accredited to Englishman Dr. Richard Shuckburgh an army doctor. The tune comes from the English nursery rhyme Lucy Locket. English ballads had a large influence on American folk music, eventually spawning such genres as old time, country, and bluegrass. Of the top ten family names in the United States, seven have English origins or having possible mixed British Isles heritage, the other three being of Spanish origin. Many African Americans have their origins in slavery (i.e. slave name). Many of them came to bear the surnames of their former owners. Many freed slaves either created family names themselves or adopted the name of their former master. According to 2000 U.S. Census data, eight of the top ten surnames in the United States are of British Isles origin, while two are the most common surnames among Hispanics. In the last UK Census in 2001, surnames in England can be compared to the United States with 6 of the family names in England being in both their top ten. Many English surnames are also found in Ireland. This is attributable to a number of factors, including the Protestant Plantation of Ireland, the imposition of the Penal Laws in the 1700s which forced many Irish people to Anglicize their surnames, and English ancestry in the Irish population itself, especially in the area around Dublin. Also, in the 9th century, Viking invaders brought many Norse names to Ireland that they had already brought to England when they established and settled the Danelaw. Scandinavian names may have been brought to England in pre-Viking times, especially in the North and East, due to Anglo-Saxons from Denmark. and the Anglo-Normans who invaded Ireland in the 1170s brought many Norman French names which had already spread to England. It should be pointed out, however, that a significant number of non-English immigrants anglicized their surnames. For example, "Smith" may come from German Schmidt, or Dutch Smit; "Johnson" from Norwegian or Danish Johansen, Dutch Jansen, or Swedish Johansson, "Brown" from German Braun, "Miller" from German Müller, and so forth. On the other hand, "Williams", "Jones", and "Davis", which are often associated with Welsh ancestry due to their common occurrence in Wales, are actually mostly English, as Wales has a much smaller population (and diaspora) than England. 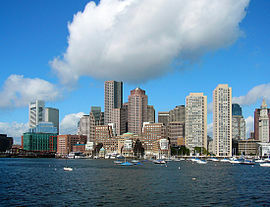 Boston, Massachusetts, is named after Boston, England. In 1664, the English renamed "New York" after (James II of England) the Duke of York. Wilmington named by Proprietor Thomas Penn after his friend Spencer Compton, Earl of Wilmington, who was prime minister in the reign of George II of Great Britain. Georgia was named after King George II. Maryland named so for Queen Henrietta Maria (Queen Mary). Burlington County and Burlington after the English east-coast town of Bridlington. Camden named by local Jacob Cooper after Charles Pratt, 1st Earl Camden. Gloucester County and Gloucester City after the city of Gloucester / county of Gloucestershire in England. Liverpool Village after Liverpool England. Lancaster County and Lancaster after the city of Lancaster in the county of Lancashire in England, the native home of John Wright, one of the early settlers. Warminster after the small town of Warminster in the county of Wiltshire, at the western extremity of Salisbury Plain, England. The province, named Carolina (The Carolinas-North and South) to honor King Charles I of England, was divided into SC and NC in 1729, although the actual date is the subject of debate. The name Virginia was first applied by Queen Elizabeth I (the "Virgin Queen") and Sir Walter Raleigh in 1584. 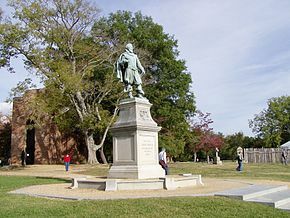 Richmond named by William Byrd II after Richmond, London where he spent part of his childhood. American Architecture, particularly in the nation's earlier years, has long been strongly influenced by English styles. The United States Capitol building, for example, was first designed by English-educated American Architect William Thornton, and bears a resemblance to St Paul's Cathedral in London. Also, many American college campuses, such as Harvard, Penn, Yale, Brown, Williams, Princeton University, and the University of Delaware, have English Georgian or English gothic architecture. For a more comprehensive list, see List of Americans of English descent. Most of the Presidents of the United States have had English ancestry. The extent of English heritage varies in the presidents with earlier presidents being predominantly of colonial English Yankee stock. Later US Presidents' ancestry can often be traced to ancestors from multiple nations in Europe, including England. Thomas Jefferson, James Madison John Quincy Adams, Andrew Jackson, William Henry Harrison, John Tyler,Zachary Taylor, Millard Fillmore,Franklin Pierce, Abraham Lincoln, Andrew Johnson, Ulysses S. Grant, Rutherford B. Hayes, James A. Garfield, Chester A. Arthur, Grover Cleveland, Benjamin Harrison, William McKinley. Theodore Roosevelt, William Howard Taft, Warren G. Harding, Calvin Coolidge, Herbert Hoover, Franklin D. Roosevelt, Harry S. Truman, Lyndon B. Johnson, Richard Nixon, Gerald Ford, Jimmy Carter, Ronald Reagan, George H. W. Bush, Bill Clinton. 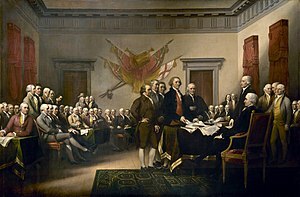 The U.S. Presidents which lacked recent English ancestry were James Monroe, Martin Van Buren, James K. Polk, James Buchanan, Woodrow Wilson, Dwight Eisenhower, and John F. Kennedy. Also, President Donald Trump does not have recent English ancestry, with all of his recent ancestry coming from Germany and Scotland. ^ In the 1980 census, 49,598,035 Americans identified as being of English ancestry, although in later censuses most of these same people identified as being of "American" ancestry, when that was added as an option. ^ a b c d e f g h i j "Table 3. Persons Who Reported at Least One Specific Ancestry Group for Regions, Divisions, and States: 1980" (PDF). Census.gov. Retrieved 21 August 2017. ^ Bureau, U.S. Census. "American FactFinder - Results". factfinder.census.gov. Retrieved 21 August 2017. ^ Pulera, Dominic (20 October 2004). "Sharing the Dream: White Males in Multicultural America". A&C Black. Retrieved 21 August 2017 – via Google Books. ^ Stanley Lieberson and Lawrence Santi, 'The Use of Nativity Data to Estimate Ethnic Characteristics and Patterns', Social Science Research, Vol. 14, No. 1 (1985), pp. 44-46. 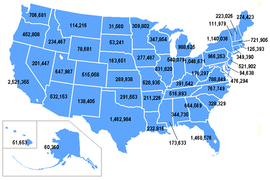 ^ "1980 United States Census" (PDF). Docs.google.com. Retrieved 21 August 2017. ^ Ben J. Wattenberg (1985). "Chapter 14. The First Universal Nation". The Good News Is the Bad News Is Wrong. American Enterprise Institute. p. 77. ISBN 978-0-671-60641-1. ^ a b "English Emigration". Spartacus.schoolnet.co.uk. Retrieved 21 August 2017. ^ Lieberson, Stanley; Waters, Mary C. (1988). "From Many Strands: Ethnic and Racial Groups in Contemporary America". Russell Sage Foundation. ^ "Census.gov Persons Who Reported at Least One Specific Ancestry Group for the United States: 1980" (PDF). Census.gov. Retrieved 21 August 2017. ^ Encyclopedia of North American Immigration. Books.google.com. Retrieved 17 March 2015. ^ Boyer, Paul S.; Clark, Clifford E.; Halttunen, Karen; Kett, Joseph F.; Salisbury, Neal (1 January 2010). "The Enduring Vision: A History of the American People". Cengage Learning. Retrieved 21 August 2017 – via Google Books. ^ "Scots to Colonial North Carolina Before 1775". Dalhousielodge.org. Retrieved 17 March 2015. ^ "U.S. Federal Census :: United States Federal Census :: US Federal Census". 1930census.com. Retrieved 17 March 2015. ^ Parrillo, Vincent N. (30 November 2015). "Diversity in America". Routledge. Retrieved 21 August 2017 – via Google Books. ^ Lieberson, Stanley; Waters, Mary C. (20 September 1988). "From Many Strands: Ethnic and Racial Groups in Contemporary America". Russell Sage Foundation. Retrieved 21 August 2017 – via Google Books. ^ A Century of Population Growth. From the First to the Twelfth. First published 1909. ^ A Century of Population Growth - From the First to the Twelfth. First published 1909. ^ a b The Source. Books.google.com. Retrieved 17 March 2015. ^ "Table 1. United States - Race and Hispanic Origin: 1790 to 1990" (PDF). Webcitation.org. Archived from the original (PDF) on 2010-02-25. Retrieved 2017-08-21. ^ McKee, Jesse O. (21 August 2017). "Ethnicity in Contemporary America: A Geographical Appraisal". Rowman & Littlefield. Retrieved 21 August 2017 – via Google Books. ^ a b Orth, Samuel Peter (21 August 2017). "Our Foreigners: A Chronicle of Americans in the Making". Library of Alexandria. Retrieved 21 August 2017 – via Google Books. ^ "U.S 1790 Census" (PDF). Census.gov. Retrieved 21 August 2017. ^ "BBC NEWS - Special Reports - Brits Abroad". News.bbc.co.uk. Retrieved 17 March 2015. ^ "Office for National Statistics (ONS) - ONS". Statistics.gov.uk. Retrieved 17 March 2015. ^ "Top 101 cities with the most residents of English ancestry (population 500+)". Retrieved 2007-08-02. ^ "Newport, Christopher". Infoplease.com. Retrieved 17 March 2015. ^ "Bassetlaw Museum". Bassetlawmuseum.org.uk. Retrieved 21 August 2017. ^ "Pilgrims - Learn English". Learnenglish.org.uk. Retrieved 21 August 2017. ^ Bradford, William (1898). "Book 2, Anno 1620". In Hildebrandt, Ted (ed.). Bradford's History "Of Plimoth Plantation" (PDF). Boston: Wright & Potter. Retrieved 2006-06-01. ^ "Digital History". Digitalhistory.uh.edu. Retrieved 21 August 2017. ^ "New Sweden". U-s-history.com. Retrieved 17 March 2015. ^ "Synonyms Thesaurus with Antonyms & Definitions - Synonym.com". Trivia-library.com. Retrieved 17 March 2015. ^ "Statistical Abstract of the United States". U.S. Government Printing Office. 21 August 2017. Retrieved 21 August 2017 – via Google Books. ^ "Statistical Abstract of the United States". U.S. Government Printing Office. 21 August 1968. Retrieved 21 August 2017 – via Google Books. ^ "1850-2000" (PDF). Census.gov. Retrieved 21 August 2017. ^ Patten, Eileen (21 February 2012). "Statistical Portrait of the Foreign-Born Population in the United States, 2010". Pewhispanic.org. Retrieved 21 August 2017. ^ "English Americans - History, Contemporary england, Immigration, settlement, and employment, Acculturation and Assimilation". Everyculture.com. Retrieved 17 March 2015. ^ Billington, Ray Allen (14 April 2016). "The Historian's Contribution to Anglo-American Misunderstanding: Report of a Committee on National Bias in Anglo-American History Text Books". Routledge – via Google Books. ^ "GI Roundtable Series". Historians.org. Retrieved 17 March 2015. ^ History of Colonial America. Archived from the original on 2009-10-31. ^ "The Colonial Period". Law.jrank.org. Retrieved 17 March 2015. ^ "National Virtual Translation Center". Nvtc.gov. Retrieved 2017-08-21. ^ a b Summary Tables on Language Use and English Ability: 2000 (PHC-T-20). U.S. Census Bureau. Retrieved 2008-02-22. ^ Fischer, pp. 74, 114, 134–39. ^ William Bradford, Of Plymouth Plantation 1620–1647, 85. ^ "Why isn't baseball more popular in the UK?". Retrieved July 26, 2013. ^ "Major League Baseball Told: Your Sport Is British, Not American". Telegraph. London. September 11, 2008. Archived from the original on October 16, 2008. Retrieved February 3, 2009. ^ "History of baseball exposed". BBC News. September 11, 2008. Retrieved August 3, 2013. ^ "BBC NEWS - UK - England - Baseball 'origin' uncovered". news.bbc.co.uk. Retrieved 17 March 2015. ^ "BBC - South Today - Features - Baseball history". Bbc.co.uk. Retrieved 17 March 2015. ^ Telegraph staff and agencies (11 September 2008). "Major League Baseball told: Your sport is British, not American". Telegraph.co.uk. Retrieved 17 March 2015. ^ The New American Sport History. Books.google.com. Retrieved 17 March 2015. ^ "Features - Sources of United States of America Legal Information in Languages Other than English - LLRX.com". Llrx.com. Archived from the original on 2 April 2015. Retrieved 17 March 2015. ^ "Magna Charta - Magna Charta". Law.jrank.org. Retrieved 17 March 2015. ^ "COMMON LAW V. CIVIL LAW SYSTEMS". Usinfo.state.gov. Retrieved 21 August 2017. ^ "John Stafford Smith: Composer of the Star Spangled Banner". Archived from the original on 2007-07-11. ^ "Fort McHenry - National Anthem". Web.archive.org. 21 July 2007. Archived from the original on 21 July 2007. Retrieved 21 August 2017. ^ Lesley Nelson. "Star Spangled Banner". Contemplator.com. Retrieved 17 March 2015. ^ Heintze, James R. (9 January 2007). "The Fourth of July Encyclopedia". McFarland. Retrieved 21 August 2017 – via Google Books. ^ "'Amazing Grace'". NPR.org. 29 December 2002. Retrieved 17 March 2015. ^ Lomax, John A.; Lomax, Alan. American Ballads and Folk Songs. p. 521. ^ Sam Roberts (2007-11-17). "In U.S. Name Count, Garcias Are Catching Up With Joneses". The New York Times. Retrieved 2007-11-18. ^ a b "Ucl.ac.uk/paediatric-epidemiology Most common surnames in Britain" (PDF). Ucl.ac.uk. Retrieved 21 August 2017. ^ Kimberly Powell. "English Surnames: Meanings and Origins". About.com Parenting. Retrieved 17 March 2015. ^ Kimberly Powell. "Smith - Surname Meaning, Origin and Genealogy". About.com Parenting. Retrieved 17 March 2015. ^ "Scottish Surnames". Fife.50megs.com. Retrieved 17 March 2015. ^ "A History of Irish Surnames: Is Yours Here?" An example of this was the common Irish surname Mac Gabhann, which meant "son of a smith". Some Mac Gabhanns, living in County Cavan, had their name translated to Smith and it remained that way. Smith is the fifth most common surname in Ireland. ^ Kimberly Powell. "Johnson (Surname) - Origin and Genealogy". About.com Parenting. Retrieved 17 March 2015. ^ "Is Your Last Name Johnson? Learn What it Means and Where it Came From!". Thoughtco.com. Retrieved 2 January 2018. ^ Kimberly Powell. "Williams - Meaning and Origin of This Surname". About.com Parenting. Retrieved 17 March 2015. ^ Kimberly Powell. "BROWN - Surname Meaning, Origin and Genealogy". About.com Parenting. Retrieved 17 March 2015. ^ Kimberly Powell. "JONES - Surname Meaning - Origin for the Surname Jones Genealogy". About.com Parenting. Retrieved 17 March 2015. ^ Kimberly Powell. "Origin for the Surname Garcia - Genealogy". About.com Parenting. Retrieved 17 March 2015. ^ "The Geography of European Surnames". Geocurrents.info. Retrieved 21 August 2017. ^ Kimberly Powell. "Origin for the Surname "Davis" - Genealogy". About.com Parenting. Retrieved 17 March 2015. ^ Kimberly Powell. "Rodriguez Name Meaning and Origin". About.com Parenting. Retrieved 17 March 2015. ^ "Williams Name Meaning & Williams Family History at Ancestry.com". Ancestry.com. Retrieved 21 August 2017. ^ "Jones Name Meaning & Jones Family History at Ancestry.com". Ancestry.com. Retrieved 21 August 2017. ^ "Davis Name Meaning & Davis Family History at Ancestry.com". Ancestry.com. Retrieved 21 August 2017. ^ "The State of Maryland". Netstate.com. Retrieved 17 March 2015. ^ "The State of Maryland". netstate.com. ^ "A Tale of Two Bostons - iBoston". Iboston.org. Retrieved 21 August 2017. ^ "ePodunk". Epodunk.com. Retrieved 21 August 2017. ^ http://www.n-state.com, NSTATE, LLC:. "The State of New Hampshire - An Introduction to the Granite State from NETSTATE.COM". Netstate.com. Retrieved 21 August 2017. ^ "New Hampshire". boulter.com. Retrieved 21 August 2017. ^ Hutchinson, Viola L. The Origin of New Jersey Place Names, New Jersey Public Library Commission, May 1945. Accessed December 1, 2017. ^ Kane, Joseph Nathan; and Aiken, Charles Curry. The American Counties: Origins of County Names, Dates of Creation, and Population Data, 1950-2000, p. 112. Scarecrow Press, 2005. ISBN 0810850362. Accessed January 21, 2013. 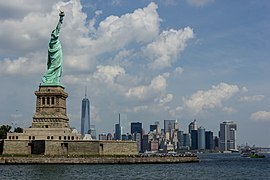 ^ "New York State Information - Symbols, Capital, Constitution, Flags, Maps, Songs". 50states.com. Retrieved 21 August 2017. ^ Espenshade, A. Howry (1925). Pennsylvania Place Names. Harrisburg, PA: The Evangelical Press. p. 37. ^ "PHMC Doc Heritage: Lancaster County Petition". Web.archive.org. 7 August 2006. Archived from the original on 7 August 2006. Retrieved 21 August 2017. ^ "WARMINSTER TOWNSHIP HISTORY". Township of Warminster. Retrieved 2015-07-31. ^ "WARRINGTON TOWNSHIP HISTORY". Township of Warrington. Retrieved 2017-12-01. ^ "WARWICK TOWNSHIP HISTORY". Township of Warwick. Retrieved 2017-12-01. ^ "The Split - One Colony Becomes Two". Carolana.com. Retrieved 21 August 2017. ^ In 1584 Sir Walter Raleigh sent Philip Amadas and Arthur Barlowe to lead an exploration of what is now the North Carolina coast, and they returned with word of a regional "king" named "Wingina." This was modified later that year by Raleigh and the Queen to "Virginia", perhaps in part noting her status as the "Virgin Queen." Stewart, George (1945). Names on the Land: A Historical Account of Place-Naming in the United States. New York: Random House. p. 22. ^ "City of Portsmouth History". City of Portmouth. Retrieved 2017-12-01. ^ "Genealogy and Ancestry of Barack Obama and the Other U.S. Presidents". ^ "AmericanHeritage.com / The Presidents: George Washington". Web.archive.org. 10 July 2010. Archived from the original on 10 July 2010. Retrieved 21 August 2017. ^ Irvin Haas (1992). Historic Homes of the American Presidents. Courier Dover Publications. ISBN 0-486-26751-2. ^ a b "Henry Adams". Web.archive.org. Retrieved 17 March 2015. ^ "The Fourth President • 1809-1817: James Madison". Archived from the original on January 2, 2010. Retrieved February 14, 2010. ^ Jackson, Elmer Martin (1985). Keeping the lamp of remembrance lighted: a genealogical narrative with pictures and charts about the Jacksons and their allied families. Maryland: Hagerstown Bookbinding and Printing Co. p. 9. ^ "The Ninth President • 1841-1841: illiam Henry Harrison". Archived from the original on January 2, 2010. Retrieved February 14, 2010. ^ "AmericanHeritage.com / The Presidents: John Tyler". Web.archive.org. 2 January 2010. Archived from the original on 2 January 2010. Retrieved 21 August 2017. ^ "AmericanHeritage.com / The Presidents: Millard Fillmore". Web.archive.org. 11 May 2010. Archived from the original on 11 May 2010. Retrieved 21 August 2017. ^ "The Fourteenth President • 1853-1857: Franklin Pierce". Archived from the original on February 6, 2010. Retrieved February 14, 2010. ^ Lea, James Henry; Hutchinson, John Robert (21 August 2017). "The Ancestry of Abraham Lincoln". Houghton Mifflin. Retrieved 21 August 2017 – via Google Books. ^ "Ancestors of Abraham Lincoln". Genbox.com. Retrieved 17 March 2015. ^ "AmericanHeritage.com / The Presidents: Andrew Johnson". Web.archive.org. 11 May 2010. Archived from the original on 11 May 2010. Retrieved 21 August 2017. ^ "The Nineteenth President • 1877-1881: Rutherford Birchard Hayes". Archived from the original on January 2, 2010. Retrieved February 14, 2010. ^ "The Twentieth President • 1881-1881: James Abram Garfield". Archived from the original on January 2, 2010. Retrieved February 14, 2010. ^ "The Thirtieth President • 1923-1929: Calvin Coolidge". Archived from the original on January 2, 2010. Retrieved February 14, 2010. ^ "Jimmy Carter Library". Jimmycarterlibrary.org. Retrieved 17 March 2015. ^ Chrisafis, Angelique (2005-01-27). "Scion of traitors and warlords: why Bush is coy about his Irish links". London: Guardian. Retrieved 13 July 2010. ^ "American Presidents with Irish Ancestors". Directory of Irish Genealogy. Retrieved 15 April 2008. ^ "BBC News - UK POLITICS - George W Bush, Essex boy". News.bbc.co.uk. Retrieved 17 March 2015. ^ "The Forty-Fourth President • 2009-present: Barack Hussein Obama". Archived from the original on July 10, 2010. Retrieved September 9, 2010. ^ Powell, Kimberly. "Ancestry of Donald Trump". Genealogy.about.com. Retrieved 2017-08-21.